An Interview with Wolfgang Ernst | What Is A Media Lab? Technological media (both in communication and in non-communicative contexts) are not mere cognitive constructs but really exist. Any media theory therefore needs to be archaeologically grounded in the twofold presence of media technology, that is, material (engineering) and symbolical (mathematical, logical, diagrammatic); in archaic artefacts (which are never “dead media”), in illustrative key elements (like the enlarged version of a flipflop circuit to store one “bit”), and in essential operative principles (algorithmic source code). All this becomes experimental in terms of techno-epistemological questions. Technological items need to be analyzed in action in order to reveal their media essence; otherwise a TV set is nothing but a piece of furniture. Therefore for academic media analysis it requires a pool of past media objects which teachers and students are allowed to operate with, different from the “don’t touch” imperative in most museums. The Media Archaeological Fundus is populated with core technological molecules which at first glance look outdated but become a-historical once they are deciphered with media-archaeological eyes, ears and minds. A telegraphy apparatus turns out to be “digital” avant la lettre, surpassing the age of so-called “analog” signal media like the classic electric telephone. The Fundus is clearly something that connects to your media archaeological theory, but acts as a pedagogical, education arm of that project, engaging with students. Is this collaborative, didactic component a key part of the Fundus? Indeed. Teaching of media cannot be reduced to lectures and reading only. When students are writing papers on the difference between cathode ray tube-based television and the digital videos of YouTube, they first of all have to experience what the techno-materialities of analog television haven been. However complicated the definition of “media” might be, technological media objects (the focus of the “Berlin school” of media studies) really exist(ed) and need to be experienced in performative ways. That is why, in addition to our academic students, a bunch of media artists come to visit and to make use of the Fundus as well. For academic media analysis it therefore required the establishment of a Media Archaeological Fundus which allows for students (and teachers) to literally “analyze” media, not only in abstraction but literally to take [MEDIA] apart (the ancient Greek meaning of analysis). 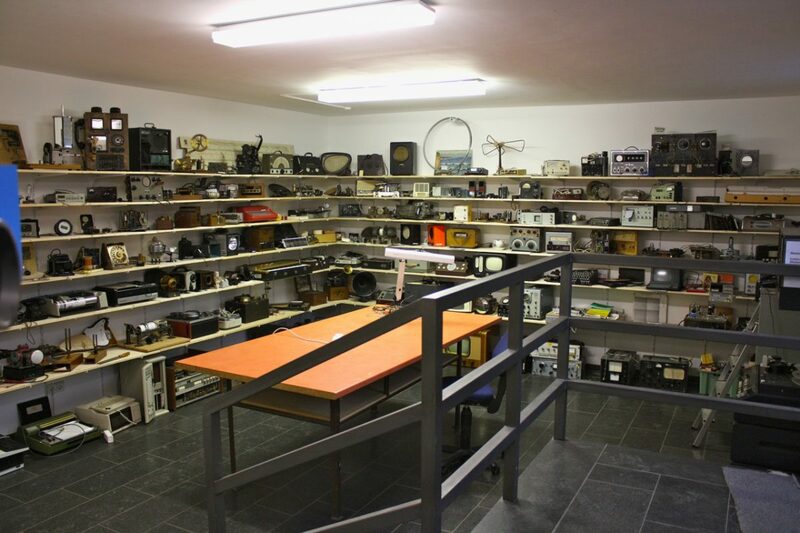 We have an impressive Technological Museum in Berlin which displays most precious originals from media history. The problem is that visitors obviously are not allowed to investigate such apparatuses manually, and for curatorial reasons these objects will not be put back into operation. But a technological medium which is not signal processing is not in its medium state at all but simply a piece of metal. For academic media analysis it therefore required the establishment of a Media Archaeological Fundus which allows for students (and teachers) to literally “analyze” media not only in abstraction but literally to take them apart (the ancient Greek meaning of analysis). That is why most of the artefacts in the shelves have been deprived of their design cover. The Fundus is not ordered according to the familiar mass media sets of radio or television or computers from past days but primarily consists of what is media-archaeologically considered as its electro-mechanical and electronic core elements: non-intuitive, even monstrous, artefacts in the best sense of a technological curiosity cabinet (Wunderkammer). A relay which was familiar in telephone communication and later in the first generation of electronic computing serves to demonstrate how media elements cross the borders and undermine conventional mass media segmentation; this incites to consider new non-historiographical philosophies of how media exist in time. Such a pool is meant to represent both aspects of media-archaeological artefacts: the material “analogue” devices and the new type of digital artefacts such as glitches, known from defect pixel representation on computer screens. Therefore the Fundus is linked with a Signal Laboratory for the close reading of data processing. Following the enthusiasm concerning “Media Labs” (at MIT and then other places too) that started in the 1980s, institutions are nowadays building more and more Humanities Labs – some more specifically related to Digital Humanities, some to Design, some to other sorts of Humanities spaces and activities. Does the Fundus in some way relate to the idea of a “lab” – and how might it differ from some of the other examples we see today? I personally got my first impressions of such “labs” from the so-called Media Lab at the freshly founded Academy of Media Arts in Cologne, as “artistic-academic” assistant teacher and researcher in the late 1990s. In those days computers for digital image sequences (rendering) were still costly and a privilege to students of such an educational institution. Nowadays every student with media-artistic ambition can install his own “lab” with free software on his private computer. I want to add, though, that the yearbook of the Cologne Academy for which I acted as an editorial production assistant has been called “Lab” as well (Lab. Jahrbuch für Künste und Apparate). In the academic context, material analysis of technological devices is always coupled with its epistemological reflection, which is still best expressed in words and texts. Nowadays, “labs” spread around the institution in an almost inflational way. But a significant shift of emphasis has taken place: The traditional scientific laboratory has been a very material theatre for creating “epistemological objects” (as described by Canguilhem and Rheinberger); nowadays experimentation takes place almost exclusively in the calculating of space (computer modelling). Most Digital Humanities labs which employ algorithmic research to big data for new kinds of information within the humanities disciplines miss the material aspect of cultural analysis which first of all starts with the hardware employed for research itself. The most intelligent algorithm only becomes operative when implemented in the real world (that is: real time) of hardware architectures. Big data is still being processed by electronically-driven computers in the most material sense. Digital Humanities therefore require synchronous self-critical reflection of their own technological condition – a kind of “humanities of the digital” in the sense of material media philology and classical auxiliary sciences of material investigation. What has been paleography or numismatics on the traditional humanities nowadays becomes media forensics (in Kirschenbaum’s sense). Another direction towards which your Fundus seems to move is toward the practices of hacking – hacker spaces and such – where issues of openability of technologies (both in terms of code and hardware) are raised, alongside even environmental issues (such as repairing old electronics). Such projects are often however more political and usually not connected to universities. How do you see this relation between the Fundus and such practices of hacking, circuit bending, etc.? The best way to analyze a technological medium is to take it apart and to re-assemble it. As an operative form of media research this does not lead to destruction but rather gives a more precise understanding of what, in the philosophy of the 1980s, became known as de-construction. Re-assemblage as well allows for new combinatorics. To think media in relation to its technological elements is like thinking the alphabet in relation to spoken language: It allows for analysis on the sub-semantical level and leads to re-combinations in techno-poetic ways. Together with its sister laboratory, the Signal Lab, the Media Archaeological Fund makes transparent that what used to be hard-wiring of technical artefacts nowadays is programming. The very term for symbolical coding which remains close to the language of the machine itself is plain text here: ASSEMBLY. Hacking and circuit-bending is a form of media-political criticism, of an economy and artistic experimentation which mostly takes place outside the Humanities departments of academic universities. But when coupled to media studies, the focus of interest is a different one: to reveal and verbally make explicit the knowledge which is implicit in technologies (both in the material and the mathematical sense). Media archaeology as academic practice is applied epistemology: it does not leave technological expertise to engineering and computing sciences alone but learns and teaches how to create sparks of knowledge from objects in order to translate this into discourse. How do you see the project of the Fundus relating to issues of cultural heritage – especially cultural heritage of technology? Does it offer an alternative “model” outside museums? What is the institutional basis that it could provide as something that is also transportable outside your specific institution? It happens that the Media Archaeological Fundus is physically located right opposite to the Pergamon Museum in central Berlin. Whereas on the Museum Island art and artefacts from antiquity are housed in the traditional museum frame, the Fundus, with its LED-based message TECHNOPOIESIS right at the front entrance, incorporates the new technological antiquity of contemporary culture like an antagonistic challenge to the classical museums. In museological terms of cultural heritage, the Fundus reminds us of how cultural objects have a different nature when it comes to technologies. Just as a musical score or a theatre play only unfolds in performance, such operative (almost sonic, vibrational) museology is a new answer to techno-culture which is radically time-based. Whereas the cultural message of an ancient Greek sculpture or vase can be decoded in its pure visual and material presence once the contextual knowledge has been acquired, the cultural value of a technological artefact can be demonstrated only when being in operation – be it a signal-transforming analogue video image or a measuring oscillogram unfolding in micro-time by the scanning finger of the vacuum tube, or be it a computer program running a gaming algorithm. Just as a musical score or a theatre play only unfolds in performance, such operative (almost sonic, vibrational) museology is a new answer to techno-culture which is radically time-based. The archaic museion has been a “place for dancing” of the muses. Nowadays, the new museum has to be both operative and “algorhythmic” (Miyazaki) in order to preserve technological culture – with media-archaeological re-enactment and emulators.